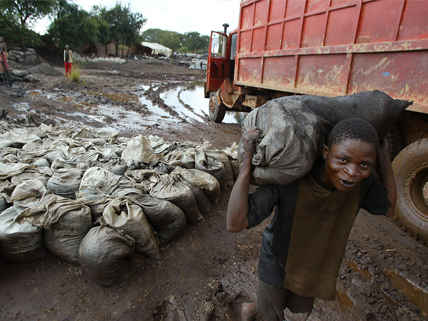 A young African man carries a sack of wet cobalt at a mine in the Democratic Republic of the Congo. “Blood Phones” are the new “Blood Diamonds.” The global economy puts an abundance of electronic devices at our fingertips, but leaves the stain of blood on the hands holding them. In the Democratic Republic of the Congo, armed groups make money to purchase weapons from the mining of minerals that are vital to the manufacture of consumer electronics. Several million Africans have died in conflicts there from war-related causes. A group of “conscious consumers” that has had enough is raising the awareness of consumers and companies alike of the tragic circumstances associated with “conflict minerals.” Conflict minerals are metals such as tin, tantalum, and tungsten that are mined in the African nation with monies earned from the trade going to support one side or the other in the ongoing war. In August the Enough Project released a report ranking the largest consumer electronics companies—makers of electronic gadgets, including smartphones, that are marketed worldwide—on their efforts to foster trade in conflict-free minerals. The goal of the project is to persuade corporations to revamp their global supply chains so as to reduce or eliminate reliance on conflict minerals. The companies that scored highest were Intel, Motorola Solutions, HP, and Apple. Enough’s scorecard is based on the percentage of its recommended actions that each company has implemented. However, according to Enough, there is still no way to guarantee that electronic devices have been manufactured without any use of conflict minerals. It plans to keep up the pressure on the consumer electronics industry while also focusing on other economic sectors where conflict minerals unfortunately play an important part: automotive, jewelry, mining, industrial machinery, and retail. In a related development, the U.S. Securities and Exchange Commission (SEC) issued a new disclosure rule regarding use of conflict minerals. This article reports on the impact that The Enough Project is having on tech companies’ use of “conflict minerals”—especially those used in the manufacture of cell phones. View the whole report by the Enough Project, with graphs displaying each company’s ratings and links to company responses to the report. Read this simple summary of the “conflict minerals” issue as it relates to the Congo. Check out this press release by the SEC detailing the new rule that requires full disclosure by companies that use “conflict minerals” in the manufacture of their products. wow interesting story wonder what they are gonna do about it….!! If you need a new phone, do your homework! find out what you’re really buying! Is your fancy phone worth lives being ended? This story was interesting, but terribly sad. why would someone do that or even take a picture of that?